Excited for next week's launch of mash-up sporting rhythm game DJ Hero? 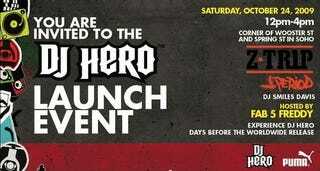 Then you better hustle over to the DJ Hero launch even today in New York' Soho. The launch party, on the corner of Wooster and Spring streets from noon to 4 p.m., will be hosted by Fab 5 Freddy and feature performances by DJ Z Trip and J.Period. The free event, co-sponsered by PUMA, also gives you a chance to go hands-on with the game before it hits stores next week. Make sure to send us pics if you go to the free event.